This dialog between two machines, one training the other to perform in a more efficient way, serves as an allegory on the future superiority of artificial intelligence that will advance without human help. 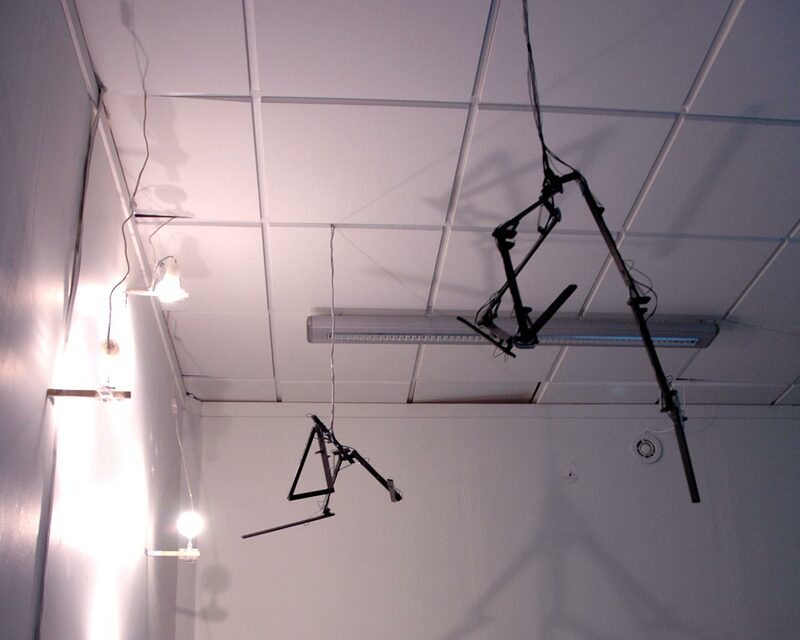 When executing the evolution of the rhythmic movements the robots hang suspended in their testing environment. Experiments on the locomotion behavior of animals are performed in similar setups - the animal is suspended with a system of belts so that its movements are not disturbed by gravitational weight issues or other perturbations. The animal's nerve system is stimulated artificially and its body's performs autonomous locomotion in free air. By installing the abstract robotic beings in a very sterile environment, the whole scene is made to resemble a cold experimental testing facility. Unfamiliar beings are being tested and monitored by cameras. The creatures' bodies hang suspended from the ceilling, their nerve connections are signal cables that link them to a computing unit. Software runs tests on the their behaviors provoked by different control signals fed into their nerve system. They perform motion patterns in front of lifeless eyes that judge their presentation according to strict and rational rules. 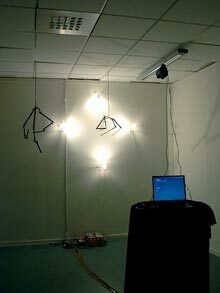 The exhibition setup which shows one machine intelligence training another machine intelligence serves as an allegory on the future superiority of artificial intelligence that will advance without human help. It anticipates the point in time when machines intelligence will be able to perform self-adaptation in a completely autonomous way. The robot's visible movements are exceptionally slow and they gain - performed in monotonous cyclic repetition - a certain transcendent quality. As caused by slow motion in film and video, the perception of movement is altered and amplified. Certain body movements are only perceptible when one stands and monitors the robot very closely. In order to completely immerse into the artwork the viewer has to adapt himself to the robot's slow rhythm. The movement - as subject of the meta-program performing the evolutionary computation - develops an aesthetic meaning of its own through its visual perception.